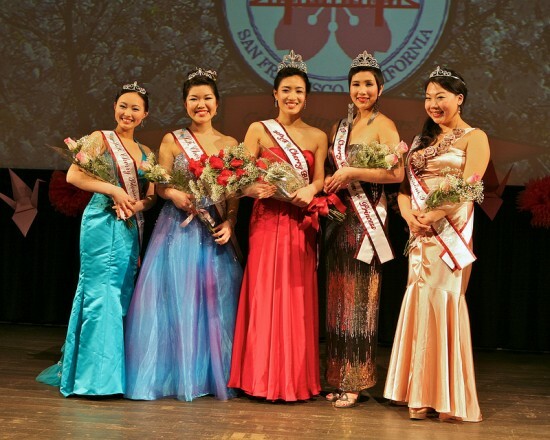 SAN FRANCISCO — Asaki Osato of San Jose was named the 2012 Northern California Cherry Blossom Queen on April 14 at the Sundance Kabuki Cinema in San Francisco Japantown. Osato, 21, is pursuing a degree in mathematics at UC Davis. A graduate of Leland High School, she is the daughter of Yoshi and Hiromi Osato of San Jose and is sponsored by Berkeley-based Takara Sake USA Inc. Her goal is find a job in finance, travel around the world, settle down and teach art or math. The new queen received a valuable furisode (long-sleeved) kimono donated by the Fujiyasu Kimono Co. in Tokyo. Stephanie Sato, 2002 Cherry Blossom Queen, gave the story behind the kimono: The company’s former president, Seishichi Ato, began providing kimono to the Cherry Blossom Festival to thank Japanese Americans for sending much-needed supplies to Japan immediately after World War II — despite being poor themselves, having just been released from the internment camps. Ato and his family were among the recipients of that aid. Kazunari Mochizuki, Ato’s successor, has continued the tradition. Osato also received awards from Hideki Oshima, vice president and northwestern regional manager of Japan Airlines, and Allen Okamoto, 2012 Northern California Cherry Blossom Festival co-chair. During her reign, the queen will visit San Francisco’s Japanese sister city, Osaka. The title of First Princess went to Megumi Yoshida, 24, of San Francisco, who has a bachelor’s degree in anthropology and film studies from Mount Holyoke College. A graduate of Benjamin Franklin High School, she is the daughter of Reiko Yoshida of Portland, Ore., and is sponsored by the Golden Gate Optimist Club of San Francisco. Her goal is to become an established filmmaker and tell her family’s immigration story. Yoshida received a pendant from Masaharu Nagasuga of Miseki Jewelry and an award from Richard Hashimoto, 2012 Northern California Cherry Blossom Festival co-chair. 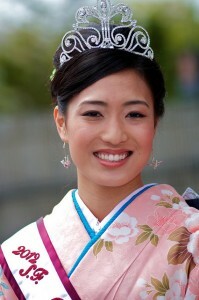 Miki Fukai, 21, of San Francisco was selected by her fellow contestants as Miss Tomodachi. A graduate of St. Croix Lutheran High School and a marketing major at San Francisco State University, she is the daughter of Kenji and Naruyo Fukai of Saitama and is sponsored by the Japanese Chamber of Commerce of Northern California. Her goal is to start a fashion business in San Francisco. The congeniality title can go to any candidate, including the winner or the runner-up. Chihiro Hirai, 21, of Berkeley, a graduate of Canadian Academy and a microbial biology major with a minor in LGBT studies at UC Berkeley. The daughter of Yohei and Junko Hirai of Sanda, Hyogo Prefecture, she is sponsored by the Nikkei Lions Club of San Francisco. Her goal is to become a physician and an active member of non-governmental organizations such as Doctors Without Borders. Manami Kadera, 22, of Santa Cruz, a graduate of Nevada Union High School and a linguistics major at UC Santa Cruz. The daughter of Tokinori and Kumiko Kidera of Nevada City, she is sponsored by Benihana. Her goal is to use foreign languages in order to work in an intercultural environment. During the talent segment, Osato performed a modern dance to “Rumor Has It” by Adele; Yoshida sang Pink Martini’s “Amado Mio”; Fukai played Nat Adderly’s “Work Song” on the trumpet; Hirai did a spoken-word piece, “If I Should Have a Daughter” by Sarah Kay; Kidera sang Sayuri Ishikawa’s popular enka “Tsugaru Kaikyou Fuyu Geshiki” (Tsugaru Strait — Winter Scene). The candidates, who appeared in both kimono and evening gowns, were judged on their individual speeches, responses during an on-stage interview, and the talent segment, as well as essays submitted and interviews conducted prior to the event. Serving as judges were Machiko Kobialka, piano faculty, San Francisco Conservatory of Music; Hayato Tamura, vice president of investments, Chase Investment Services Corporation; Haruka Roudebush, chair, Nakayoshi Young Professionals; Judy Inaba, controller, North American Group; Lorin Kagehiro, Chevron Leadership Development Program; Ellen Kiyomizu, partner, Scorch LLC; and Wendy Hanamura, vice president/strategy and general manager, Link Media Inc. The 2011 court — Queen Jeddie Kawahatsu, First Princess Tamiko Escalante, Miss Tomodachi Lauren Kawawaki, Princess Richelle Farley and Princess Kaori Saito — reflected on the past year and said their farewells. The emcee was Heather Ishimaru of ABC7 News. Hiroshi Haruki, president of the Japanese Chamber of Commerce of Northern California, presented a donation to the Cherry Blossom Festival. Consul General Hiroshi Inomata presented Benh Nakajo, long-time chair of the queen program, with the Foreign Minister’s Commendation for his years of community service and promotion of U.S.-Japan cultural exchange. 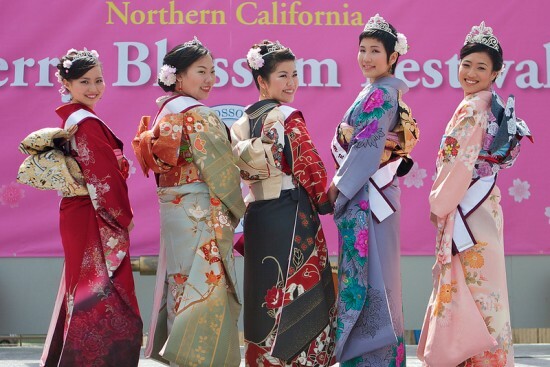 The 2012 court will serve as goodwill ambassadors for the Northern California Japanese American community at various local events as well as Nisei Week in Los Angeles and Nikkei pageants in Seattle and Honolulu. The queen program was held on the first day of the Cherry Blossom Festival, a two-weekend event. The festival’s Grand Parade on April 22 was an opportunity to see the 2011 and 2012 Cherry Blossom Courts and visiting “royalty” from the other cities.